Synopsis: After discovering the truth of his parentage and promising his mother he will never reveal said truth, Richard Devine leaves home knowing he will never return. He comes across a crime already committed and is taken for the murderer. Unable to save himself, he is shipped off to Australia with the other characters that are to play out his fate with him. The main reason I picked this up is that I can remember watching it in the eighties when it was televised. I could remember that I enjoyed it but not the details of the story so my expectations were high. I was not disappointed. As I have mentioned before, I don’t find it easy to read classics as I tend towards modern fiction. Howver, while the language and sentence structure definitely dated the novel, the themes definitely still resonated and the plot was extremely pacy (my usual complaint about classic novels is the lack of action compared to the number of words expended.). This is a long book – 620 pages – but it never once dragged and I was never tempted to abandon it. Richard Devine – or Rufus Dawes as he becomes – is the noble prisoner and is easy to empathise with. He becomes symbolic of the way that men are destroyed by a barbaric system carried out by bullying men. There is a clear moral here about a system that treats men like animals and then is surprised when animals is what they become. Interestingly, Clarke also hints that too liberal a system would not work either. He offers no solutions to how punishment should be meted out but simply shows that too lax or too strict does not work. 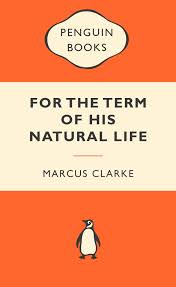 I think that this is what makes it palatable – whilst Clarke has a clear point to make, he never moralises but leaves it to the reader to make up their own minds. There is something a little soap opera-ish about some of the subplots especially as the twists and turns often are based on mistaken identity, loss of memory and coincidence. In the hands of a lesser writer this might have been hard to take but Clarke masterfully switches between the subplots and allows all his characters to become real to the readers – they are never mere devices. If I have any complaint, it would be the length of time it took to read it. I did sometimes think, I’m sure this could all be set down with less words – Clarke goes into detail about everything including the geography of the prison islands. Howver, it would be hard to know what you could take out as every detail proves crucial in the end – even the geography which figures in the various escapes made by the convicts. The ending of the novel is devestating and if I’d remembered it from the TV programme, I may not have managed to finish it. However, it is a fitting ending and anything else would have given a romance to the tale and made the reader forget the horror and pain of Rufus Dawes’ life.